We wrote only last week that it seems that it is the time of year again for colourful headlines about an impending big freeze. We had them at this time last year, which prompted our Chief Executive to write an opinion piece in The Times. Now we have very similar stories again, with the front page of the Daily Express declaring last week ‘Coldest winter freeze on way’ and warning that temperatures are set to plunge as low as -15C and again a week on we have another front page from the Daily Express which declares ‘Coldest winter for 100 years on way‘. with the UK expected to grind to a halt within weeks. As is usual, there are uncertainties in the forecast for this period. Whilst changeable conditions are considered more likely initially, some signs are beginning to emerge for more settled conditions to develop over parts of Europe. The signal is that these conditions may extend towards the UK during the first part of December. So, although there are no strong indications of any particular weather type predominating, on balance, colder and drier-than-average conditions are favoured over the recent mild and damp weather many areas have experienced. What is clear from the forecast is that although there are some signs that after a rather unsettled period, the weather may become colder and drier than we have seen recently there is still a lot of uncertainty in the forecast which again the article has failed to pick up on and report to its readers. Ultimately, we’re heading into winter and it is perfectly possible that we will see the whole range of weather that we get in winter at some point over the coming months, including snow and freezing temperatures, but also heavy rain, windy weather and mild conditions too. Our five day forecasts and warnings will provide you with the best possible guidance on any periods of cold weather, frost or the likelihood of snow, giving detailed local information across the UK to help you make the most of the weather over the coming months. This entry was posted in Met Office in the Media and tagged Daily Express, december, Met Office, snow, temperature, weather. Bookmark the permalink. The Daily Express is a regular for this kind of story; but don’t worry, we have learnt to ignore this paper. As indeed we should ignore any tosh sent out by the Met Office. As recently as 2011, we were assured that the southern UK will experience temperature increases of 3C by 2100 and northern UK 2.5C. This was from the output from climate models that the Met Office have complete confidence in. Since 1780 (roughly the start of the industrial revolution), the UK has experienced an increase of 0.6C and it’s been getting colder for the last 10 years. The Met Office climate model projections are clearly ludicrous. Full details of the climate change projections are shown within the report that you link to. This is in particular Ch2. Which can be found on pages 63-68. More information on how scientists use climate projections can be found here http://www.metoffice.gov.uk/climate-change/guide/future/projections. Your citation of the past 10 years is disingenuous – either you don’t realise it because you’ve placed your belief in it as it confirms your biases, or you’re being wilfully ignorant. 10 years is too short a period of time to take a representative sample. If you take at least the past 30 years, you will see an unquestionable rapid increase in average global temperatures. 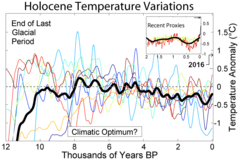 To expect a linear rise is just ludicrous – the climate is not as simple as that. The temperature rises in a zig-zag fashion so that, if you extract a small set of years (such as the 10 you cite), it can look like there has been a decrease, but the bigger picture is a general trend upwards. I suggest you are less selective with the data in future. Callum, I’ve provided statistics produced by the Met Office from 1772. 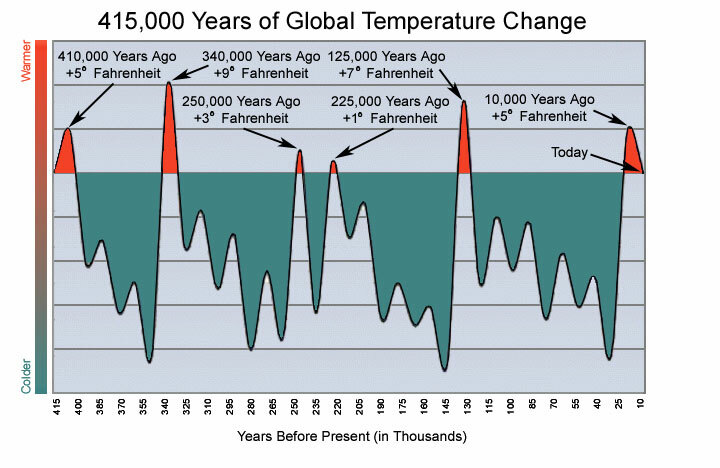 The long term trend is an increase of 0.6C in the last 240 years. That’s way below the IPCC AR4 claim that the computer models that they have considerable confidence in predict an increase in global temperature of 0.2C per decade until 2100 by which time we can allegedly expect a 2C increase. There is nothing in the long term trend which supports this scaremongering, and like it or not the earth has cooled over the last 10 years, as indeed it was flat for the the first 82 years of the longest running global temperature record and indeed for another 47 year long period. 10 years may be too short (although the IPCC is happy to produce decadal predictions) but fixating on 30 years looks very suspicious since 1 of the few periods of rapid increase in global temperature just happened to have started just over 30 years ago. If you believe that the longer the trend the better, then why do you have a problem with the longest global temperature record available (shown below)? Ah yes. Shoot the messenger. Always a good one. Look – the Daily Mail is beyond garbage laden, yet were the first paper to note that Gordon Brown was certifiable. So they are not always wrong, are they?! – Yet you promote panic and fear by assuring people that you’re pretty sure we’ll be boiling in our own juices in the coming century and that it will be irreversible and that the science is “robust”. The Mystic Met office strikes again. Dave, the article says that we shouldn’t look at just a few years but over the long term. According to your own records, over the long term, the UK temperatures have hardly increased at all and over the short term (last 10 years), the UK has been getting progressively colder. So why are you still spinning the global warming myth when you know your own statistics expose this as a lie. You need to look at trends over longer than 10 years to identify trends. We would recommend 30 years as a minimum. The Met Office admits it’s long term forecasts are complete rubbish yet still tries to convince us that it’s even longer term climate forecasts are credible. The fact is that the Met Office nor anybody else has a clue how the weather/climate will pan out for a period greater than a few days at best. My guess is that this year in the UK will be colder than last year based on the evidence that we’ve been getting colder over the last 10 years. As you can see from the graph, the UK is currenlty only 0.6C warmer than it was at the start of the industrial revolution. Monthly stats go further back to 1659 and show hardly any increase since that time. The UK records are the longest reliable temperature records on earth. Of course, we’ll hear that the UK is not the globe yet the Met Office is quite happy to push out predictions that the UK summers will be like those we currently have in Spain within 50 years. James, that is not quite true. All long range forecasts of several months ahead can only provide limited information on how our weather may differ from ‘normal’. For example will the general weather over that period of time be warmer, colder, wetter, drier than what you may normally expect. This provides some useful information to specific stakeholders, but perhaps is less use to people who may want to know what the weather will be like on a particular day. When looking at periods say 50 to 100 years in the future, then wE are again looking at the trends of how our climate may vary. This is very different from forecasting the detailed weather for the next couple of days. Of course there are uncertainties in climate projections, and scientists work hard to quantify these uncertainties to provide a clearer understanding of how our climate may change in the future. Currently, we’re only 0.6C warmer than it was in 1772, during which CO2 levels have risen from 280ppm to almost 400ppm. If the UK has miraculously escaped catastrophic anthropogenic global warming for the entire period since the industrial revolution started and CO2 levels started to rise, why does the Met Office think that in less than 100 years, we’re going to have a temperature rise 5 times that which we’ve experienced in the last 240 years? The sole basis for these clearly ludicrous claims are the climate models which have demonstrably failed. Dave, Nothing’s changed since 2011. You can’t publish a report claiming that the UK will be between 2.5 to 3C warmer by 2100 and then provide no reasonable explanation as to why you thought the climate model projections were credible when you must have known last year that there was no scientific basis to support it. Referring me to a link which says that climate projections should be taken with a pinch of salt is not acceptable. You’re supposed to be a scientific organisation. James. I repeat again a full explanation of the methodology used for the projections is contained within the PDF that you referred to to start with. So you’re standing by the Met Office claim that the UK will be 3C warmer in 2100 prediction then Dave, despite the fact that there have been periods lasting decades in the global temperature record during which the earth experienced no global warming yet CO2 levels increased dramatically, and indeed there has been no global warming for over 10 years now? Furthermore the UK has only had 0.6C warming since the start of the industrial revolution. This isn’t science, Dave, and you know it. Why don’t you try falling back on the defence that only approved climate scientists are allowed to read graphs? I’m surprised other fields haven’t tried that one. Estate agents could claim that only peer-reviewed estate agents are entitled to determine house prices. Stockbrokers could see that only the International Panel of Stockbrokers were allowed to say whether the stock market was rising or not. The reality is that the information is out there, and anybody with a basic understanding of science can read a graph. The 2.5 to 3C warmer prediction for the UK is solely based on climate models. Physical records show that the UK has only experienced 0.6C of warming since the industrial revolution started (~240 years ago). During this period CO2 levels in the atmosphere have increased from 280ppm to almost 400ppm. No climate model has ever accurately modelled known temperature records let alone managed to predict future temperature records. The IPCC present in their reports a range of projections based on differing emission scenarios and the output from a large number of climate models. Obviously, if you know what the historical temperature records are, you can create a computer model which appears to match the historical temperature record with some degree of accuracy, if you introduce enough variables in to your modelling formulae. The proof that your model is accurate is when unknown future temperatures match the predictions from your model. The fact is that the climate is complex. Climate scientists make an extraordinary claim that modelling the climate is somehow much easier than modelling the weather. If it’s so easy then why are they unable to form a concensus on known climatic changes which have occurred in the past. The claims in climate science reports aren’t scientific at all. For example, the Met Office claim that the UK will be warmer by between 2.5 and 3C by 2100. What does that mean? We know that from year to year, the average temperature in this country can vary considerably. For example, some of the average annual UK temperatures in the last 10 years have been colder than those in the 17th century, so to make a comparison, you’d have to decide over what period a sensible average should be made, yet this is omitted. Science is about the use of precise and unambiguous language, yet climate science can’t even agree on what periods to baseline temperatures for comparison or which temperature data set providers should be used. A question for the class. When the earth emerges from an Ice Age, how would you expect temperatures to behave? Fact – we are incredibly fortunate to be living in a periods of such moderate temperatures on Planet Earth. It may not be in my lifetime, but in planetary terms it is most likely that a new Ice Age is on the horizon. And who can tell how much money and effort will have been wasted on CAGW by then? If you truly believe over 97% of climate scientists are in a massive conspiracy you are delusional. Fact. Who said that climate scientists were wrong about AGW? What 97% agree on is that CO2 produced by humans will cause global warming; what they DON’T agree on is how much. In fact, most skeptics agree that CO2 causes warming…I do but I am skeptical about the conclusions reached based on models that are so far unimpressive. Vostok Ice Core samples for the past 400k years shows that COLD is the norm, with short warm periods (interglacials) in between. This graph suggests we’re coming out of another, and also shows we have had much warmer weather with much smaller concentrations of co2. Given that previous warming bumps in the temperature record occurred when there were much much lower co2 concentrations, how could that have happened? Nonsense. I wonder why every scientific establishment says you’re wrong. Please explain with using a conspiracy theory. Some confusion here about what “Climate” actually IS. “Climate” is the analysis of the PATTERN of weather events recorded over time in a particular place. From this analysis comes a prediction about what will happen in that place through the various seasons, in terms of temperatures, rainfall and snowfall, storms and wind, and various specific weather events like tornadoes and hurricanes, dry spells, etc. For example, in the continental US, the season for most tornadoes is Spring, for most hurricanes is summer and fall. In various regions it is more likely to rain in the summer (Florida), in others in the winter (California), in most places least of all in the Fall (while in parts of Africa, fall rains are most likely). In yet other places (like Arizona) it rains in both winter AND summer, but is dry in both Spring and Fall. Climatic systems were developed in this way to facilitate predictions for practical people, such as agriculturalists, loggers, those engaged in construction or other outdoor tasks, planners, the military, etc. In almost all parts of the world, these seasonal patterns have not changed since understanding of these basic climate patterns were first systematized in the period 1880 to 1920. Rainfall/snowfall totals wax and wane, temperatures rise and fall, records both ways are encountered, but as for the patterns, it’s business as usual. So “Climates” have not actually “changed”. There is no “climate change”. Things continue to go on as before. And within the academic climate systems as traditionally used for description, “average global temperatures” are seen as meaningless. The pattern is all. Until we see no snow in the Alps or hurricanes breaking out in all seasons in the Southern US, or an end to the summer monsoon in India, or an end to snow in Northern Russia, or some other such drastic change in pattern, it is an error to state that “climate is changing”. As a matter of fact, it is an error to attempt to detach “Climate” from a particular location, as in “global climate change”. To do is a bastardization of the language, a form of Newspeak that renders meaning impossible. Much of the misunderstanding about the subject of this article is due to this most basic fact being ignored. Real climatologists would never make a mistake like this. Phony “climate scientists”, many of them physicists or astronomers or ecologists, not students of climatic patterns, have made a career of this kind of mistake, adding nothing but confusion to the debate.